Voted AV's Best Plumbing Service 4 Years in a Row! Hydro Jetting is a process in which your sewer pipes are scoured by streams of high-pressure water shooting out of a hose at up to 3,500 psi. These high-pressure streams are strong enough to cut through and clear out any debris in your sewer lines. Hydro-Jetting is typically done through an opening called a cleanout, which is an accessible opening present in every plumbing system and designed to allow plumbers to easily clear debris and other clogs. 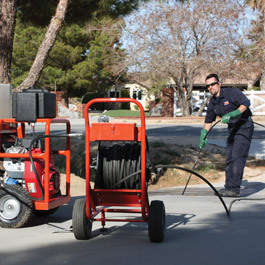 A hydro-jetter consists of a large tank of water, a high-strength nozzle, a high-pressure hose, and a machine which pressurizes the water in the hose so that it will spray out of the nozzle at a pressurized rate. When Would I Need Hydro-Jetting? Hydro Jetting is an appropriate solution when clogs cannot be removed through traditional methods such as snaking. Hydro-Jetting can easily cut through the most stubborn roots and debris and remove built-up mineral deposits, grease and other obstructions clogging the inside of your drainage line. Hydro-Jetting is also required before lining pipes because any debris that is present in the existing pipe may cause the epoxy resin in the lining become malformed and may prevent it from bonding correctly to the existing pipe. 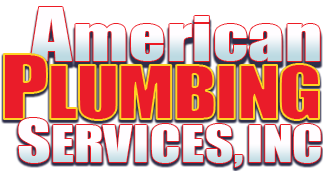 American Plumbing Services, Inc. is available for all residents located in the Antelope Valley areas of Palmdale and Lancaster, California. Contact us today to schedule an appointment to have your lines hydro-jetted. In need of service for your plumbing? Call us, we are available 24 hours to help you. Fast & Friendly Service, Value & Quality You Can Trust. 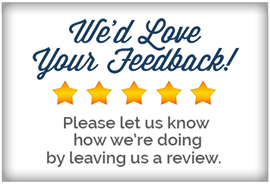 Every customer's individual needs are important to us at American Plumbing Services, Inc. Our focus of providing quality plumbing services combined with honesty has made us the first choice of many residential and commercial customers within the Antelope Valley.